North London’s Green Lanes is best known for its Turkish restaurants and grocers, but there’s another culinary reason to visit the Harringay area. Harringay Market runs every Sunday afternoon from 11.00 to 15.00 with very occasional extended seasonal opening times. Alongside a butcher, baker, fishmonger, patisserie, vegetable vendor and cheese stand, there’s a rotating selection of street food vendors. As I have a safe house nearby, I’ve had multiple chances to sample the numerous vendors’ various dishes. If you’re a local, it’s a great source of post-Saturday pick-me-ups. If you’re not a local, then it’s worth a visit if you’re going to be in this part of town and don’t fancy a kebab. Located within the playgrounds of South Harringay school, so little ones can run around at will. The vast majority of individual dishes cost around £5-6, with two enough to fill you up nicely. This guide is organised by (roughly) how frequently each vendor shows up, but the Market is an ever evolving thing. Traders come and go. There’s no guarantee that any particular trader will be at the Market on any given Sunday, so it’s best to keep tabs on the Market’s website or Twitter feed for updates. Table of Contents (you can right click on each link to open individual reviews in a new tab. Unless I’ve screwed up the coding). Backstreet Diner‘s menu consists of meat in between slices of bread, but it’s good meat and good bread. The cheeseburger is available with the usual bacon and blue cheese modifications, but these really aren’t needed. The patty used in the plain ol’ fashioned burger was juicy, a little chewy, coarsely ground and cooked medium rare – just the way it should be. The brioche-style bun stays out of the way, although the cheese is surprisingly muted. It’s a little messy to eat as the meat juices tend to dribble out everywhere, but it’s just about manageable. The steak sandwich is no rival for the excellent version from the now sadly closed Mamita Que Chorizo, but it’s still pretty good. The strips of steak cooked medium were tender with a suitably beefy tang that was complimented nicely by the sweetness of the caramelised onions, the dabs of cockle-warming dijon mustard and the gently earthy leaves. The plain jane brioche bun from the burger made a welcome reappearance. Backstreet Diner’s meat and bread staples won’t win any awards for originality, but they’re well-executed and tasty which is all that really matters. Grill My Cheese is one of the oddest market stalls I’ve encountered, serving up grilled cheese sandwiches. This student halls staple has admittedly been done well. 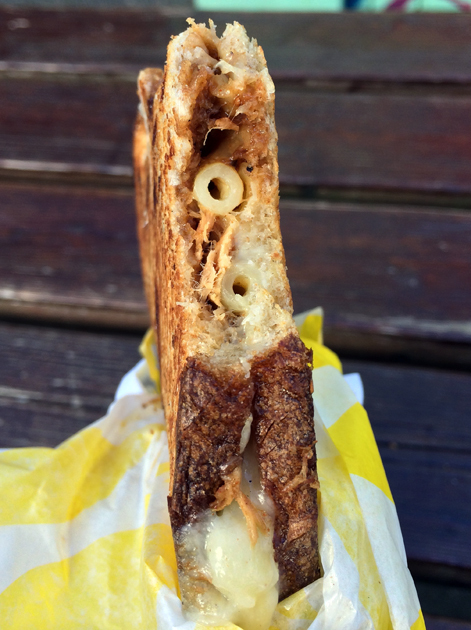 Creamy, viscous, mildly caramelised cheese sandwiched between slices of nutty bloomer was a soothing comfort food, but it still felt galling to pay £4.50 for a cheese sarnie. 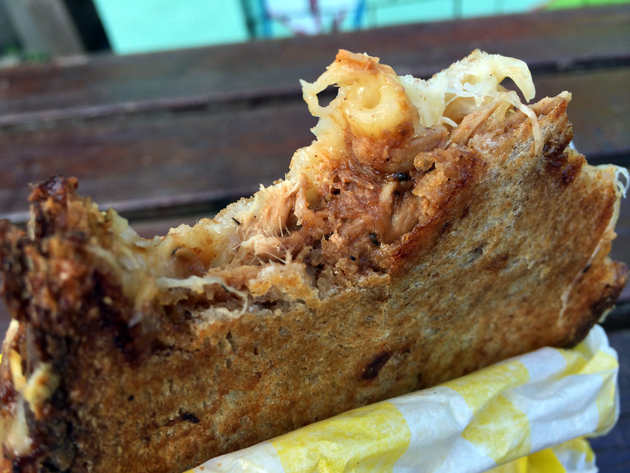 There are more elaborate variants available, such as the mac and cheese with barbecue sauce. The firm carbs and sweet dollop of sauce were mildly pleasing. A meat version adds pulled pork to the mix, but it’s hard to make it out buried as it is underneath all that cheese. Ultimately, whether you can stomach coughing up a fiver for a cheese sandwich depends on how lazy/hungover you are. I’m not that lazy and I’m never hungover. 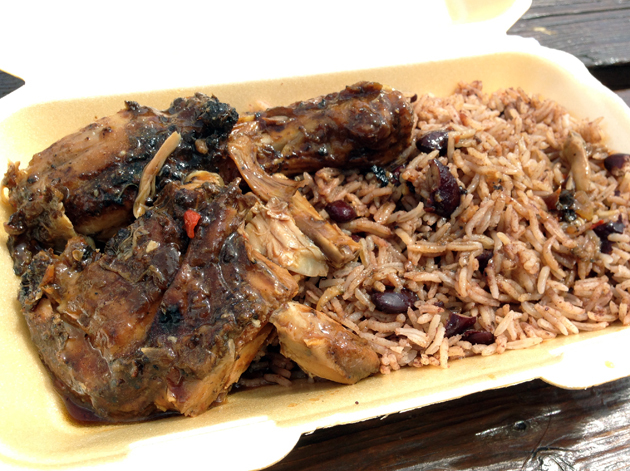 Most Jamaican eateries in London are slip shod takeaways, but Island Grill rises above such mediocrity. The richly peppered and spiced jerk chicken was well paired with nutty peas and rice which, far from being a generic pillow of carbs, tasted of cinnamon and kidney beans. The jerk chicken may get all the attention, but the goat curry deserves some love too. Tender meat on the bone served in a thin, mildly peppery sauce served with soft potatoes and other root vegetables. Simple but satisfying. 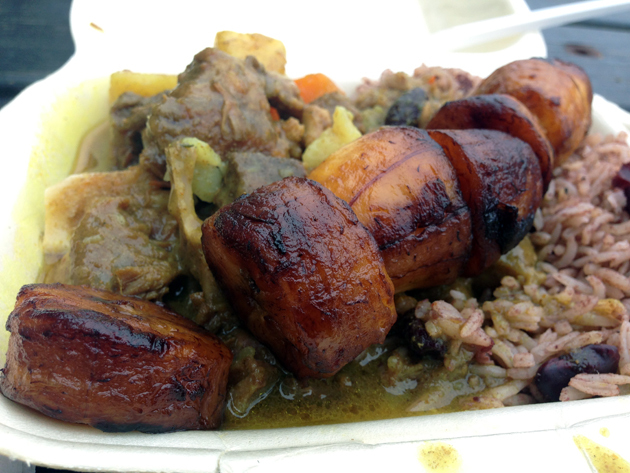 Both the jerk chicken and goat curry are available in either large or small portion sizes. It’s worth opting for the small in order to leave room for the fried plantains. In comparison to plantains I’ve had elsewhere, these sliced beauties were less starchy but still tender and sweet. 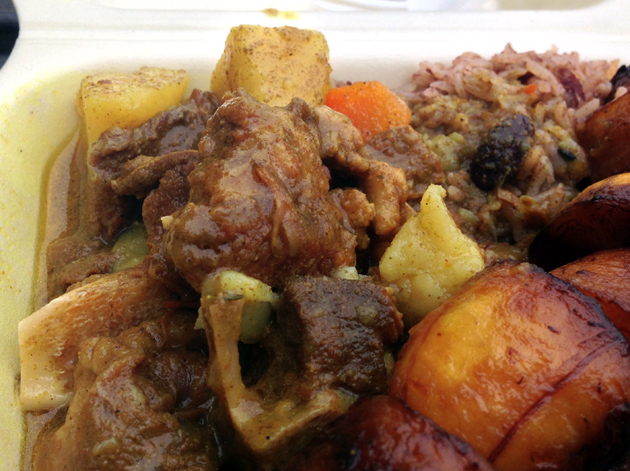 The food from Island Grill is great for a filling, flavoursome feed and is a good introduction to Jamaican food if you’ve never had it before. Pasta rarely, if ever, turns up as a street food dish, so Pasta e Basta could easily have coasted by on the uniqueness of its wares. Thankfully, the pasta here is more than just good enough. Gnocchi and pappardelle, a flat and wide noodle pasta similar to tagliatelle and sometimes substituted with tagliatelle itself, are the two pastas usually on sale and available with either a meat sauce or a vegetarian alternative. 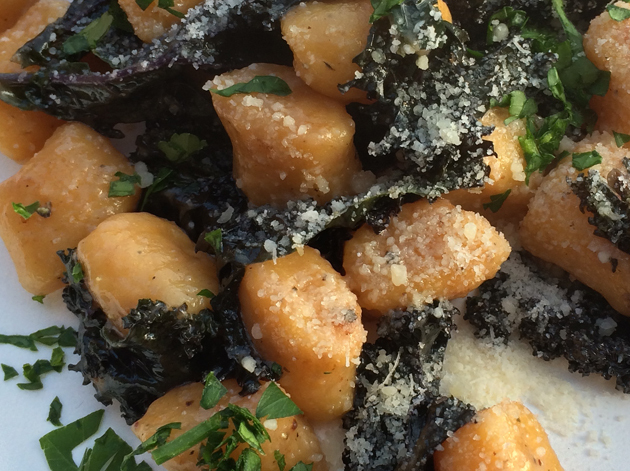 The soft and fluffy gnocchi are always a delight. 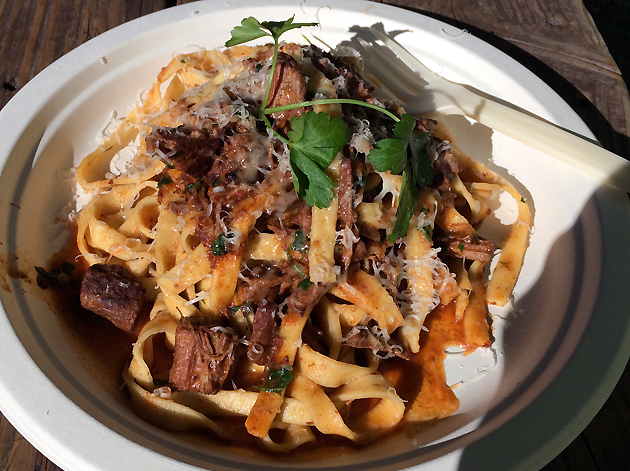 One of the most common meat-based accompaniments is the pork sausage ragu. I found the thin ragu to be a little light on actual meat, but it was still heartily moreish and livened up further with several herby hints. 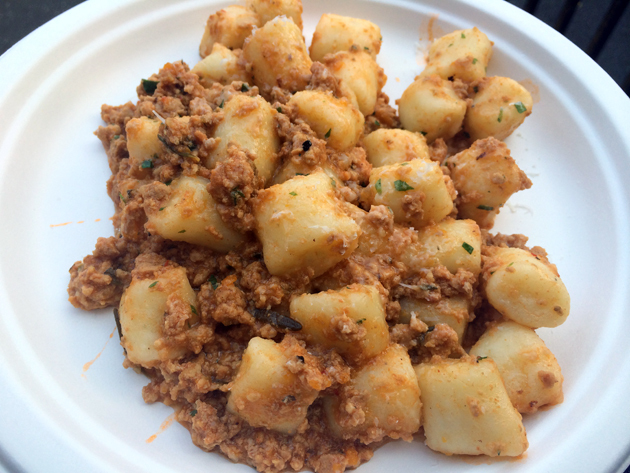 The vegetarian gnocchi variants tend to be far better. A great example is the pumpkin gnocchi, which are identical to Pasta e Basta’s usual version but with a nuttier, sweeter taste. 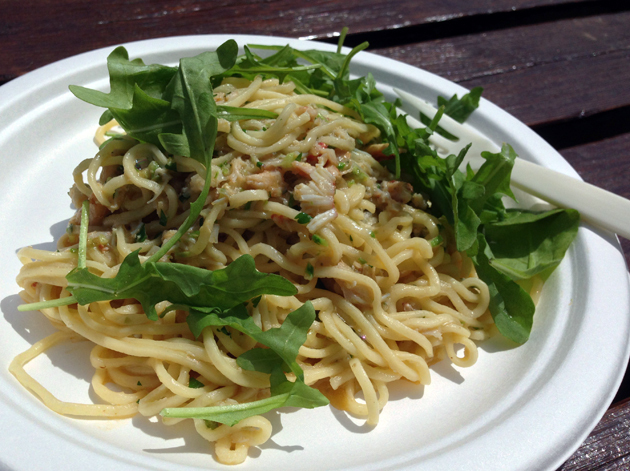 This was emphasised by a dash of lightly earthy truffle oil and the nutty, woody taste of shaved parmesan. 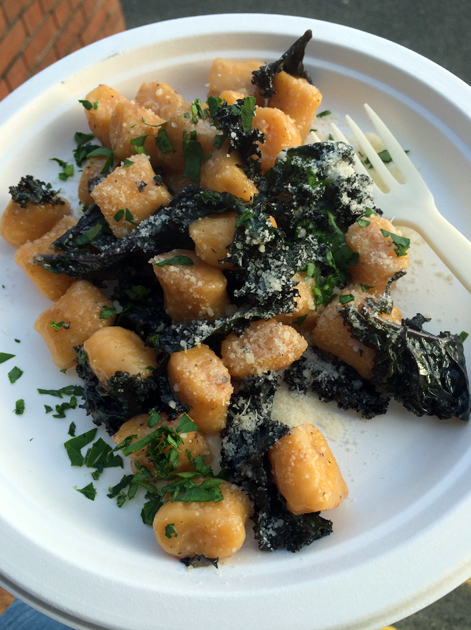 A contrast in texture to the gnocchi was provided by salty, wrinkly kale. 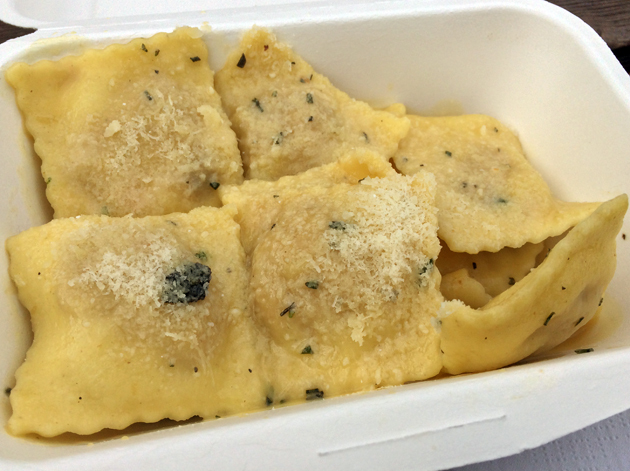 Ravioli makes less frequent appearances, but it’s well worth having when it’s available. A meat variant I tried was filled with guinea fowl and root vegetables. Even though this filling was rather anonymous, the firm ravioli skins and the thin, yet rich and aromatic butter and rosemary sauce more than made up for this. 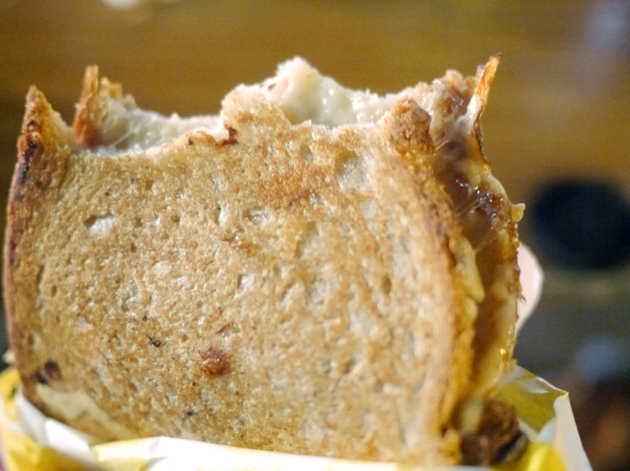 The nutty, woody shaved parmesan was the perfect finishing touch. The rabbit ravioli wasn’t a winner either, with equally limp filling, but it was at least better in other ways. 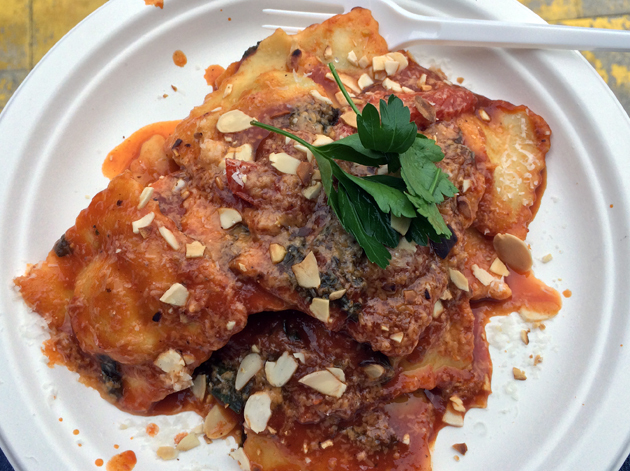 The tender ravioli skins contrasted with the crunchy toasted almonds and it was all dressed in a rich tomato sauce. This more than made up for the disappointing minced bunny. 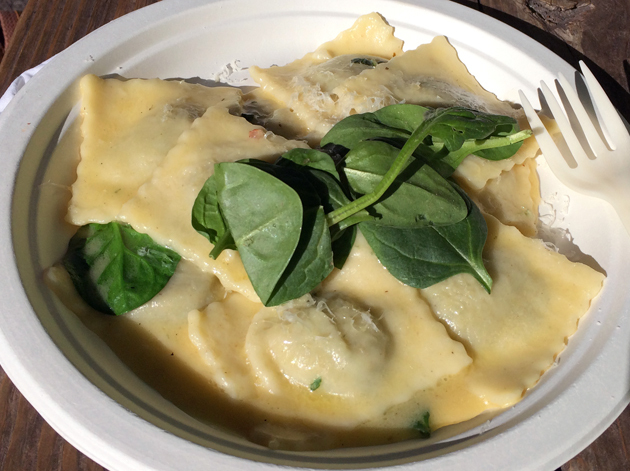 Far better was the ravioli filled with roasted pumpkin served with baby spinach. The fluffy sweet filling of the tender-skinned ravioli was complimented well by the creamy spinach, while the thin yet rich and aromatic butter and sage sauce had a hint of earthiness to it that made it all the more delectable. The only thing better than firm strands of tagliatelle are tender, earthy flecks of rich ox cheek to accompany it. Garnished with nutty, woody parmesan and it’s nigh on perfect. An occasional substitute for the pappardelle and tagliatelle is spaghetti. The version I had was drizzled in a rich garlic and white white sauce and flecked with bits of evocatively salty crab. The promised asparagus pesto was conspicuous by its absence, but this was still a delicious dish. It’s a testament to the quality of the cooking at Pasta e Basta that I would much rather eat pasta from this market stall, no matter the weather, than put up with the slop served at many of the dreary Italian restaurants I’ve been to. Top stuff. Peel and Chimney may not have an oven built into the back of a three-wheel car, but its serves up excellent pizzas nonetheless. 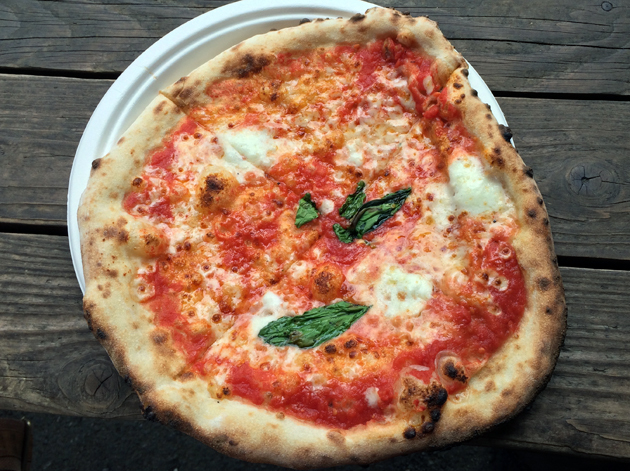 A selection of both Italian and non-Italian toppings are available and they’re all based on an excellent margherita. 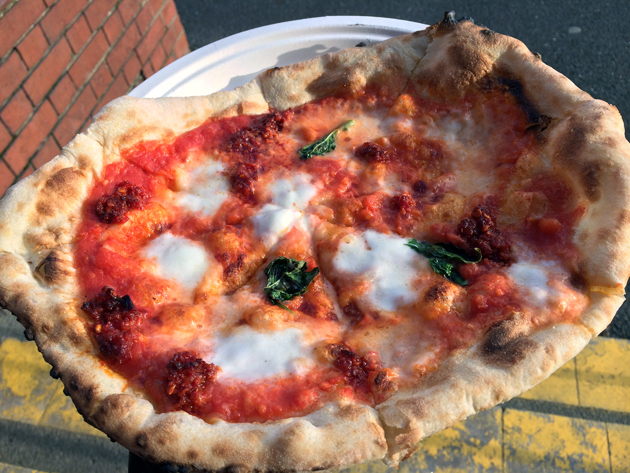 A thin, crispy, dimpled Neapolitan-style base that has a fluffy crust and topped with creamy, viscous mozzarella, punchy basil and a light, sweet and fruity tomato sauce. Peel and Chimney tends to have the margherita plus two or three pizzas on its menu. The nduja usually makes an appearance and is well worth scoffing, even though the small dollops of nduja aren’t usually very meaty. Its spicy moreishness is the main attraction. The pepperoni pizza might not be overflowing with meat, but the slices that are present were very good indeed. 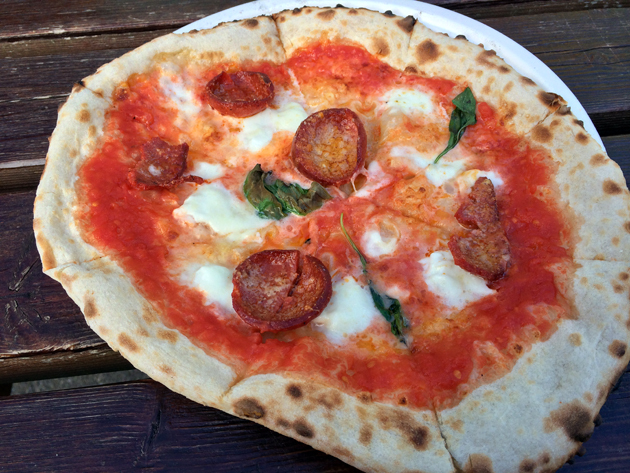 Thick, meaty and a little spicy, the pepperoni here is a revelation after a lifetime of scoffing substandard pepperoni elsewhere. 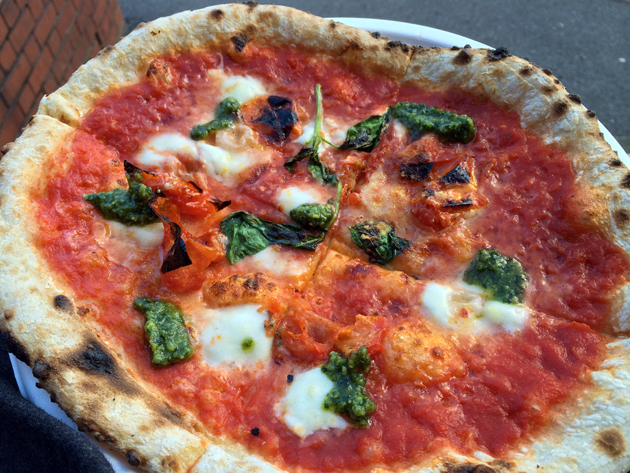 Other vegetarian alternatives available beyond the margherita include a roasted tomato and pesto version. I was sceptical about this combination, so I was pleasantly surprised by how the sweet, lightly tart roasted tomatoes enhanced the natural fruity lightness of the tomato sauce. There were only a few dabs of pesto, but its creaminess and punchy, but not overwhelming, hits of basil were a good match for the tomato flavours. Bianca pizzas only make occasional appearances, but they’re well worth having – especially if blue cheese is involved. Carefully placed dollops of lightly tangy gorgonzola complimented the creamy mozzarella exceedingly well and was enhanced further by the gentle bitterness of the wild broccoli. Splendid stuff. 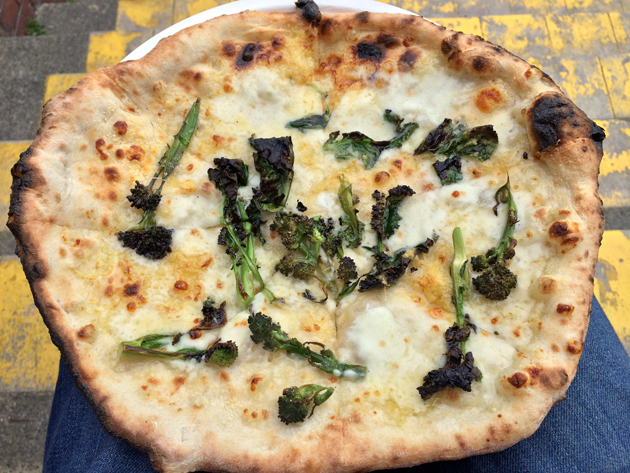 Peel and Chimney’s pizzas aren’t quite perfect, but they’re still among the best in London. 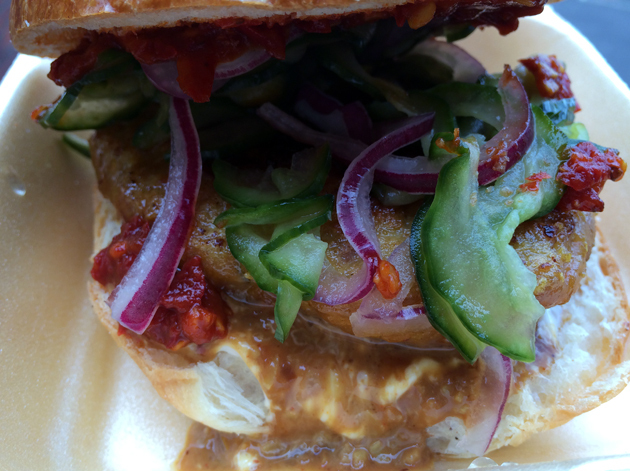 It would be easy to dismiss Sambal Shiok’s Malaysian-inspired burgers as ‘stuff in a bap flogged for £6.50’ (to borrow a phrase from elsewhere), but the pair of sandwiches here are well worth having. Satay conjures up images of sickly sweet nut sauces, but not so at Sambal Shiok. 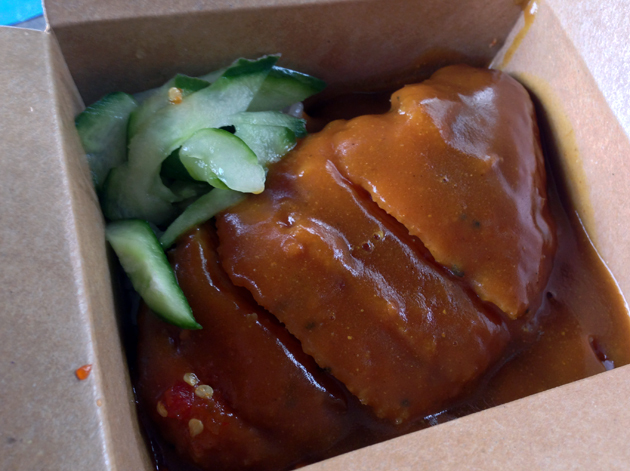 The smoothly ground chicken patty was topped with tart pickles, a punchy chilli sauce with aniseed-esque hints and a thin, nutty satay sauce that wasn’t too sweet. It was all held together by a brioche bun that stayed out of the way. Sorry for the iffy chicken burger photo folks. 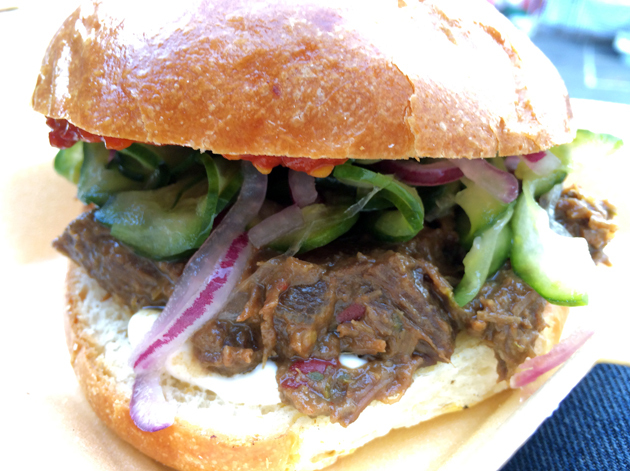 Even better was the beef rendang burger. Tender slices of earthy, nutty, slightly coarse beef were topped with the same pickles and chilli sauce that accompanied the chicken. 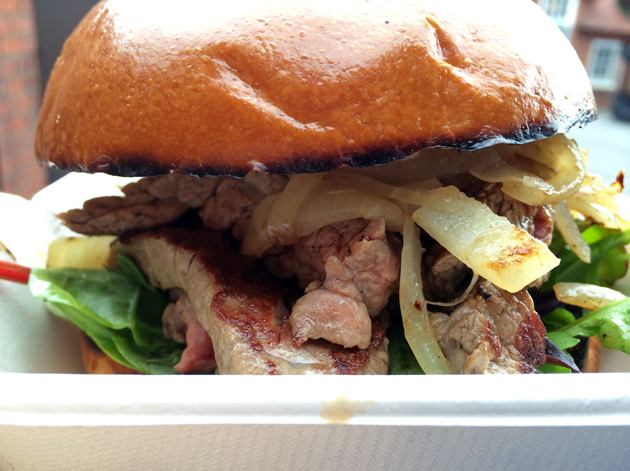 The taste and texture of the beef made this sandwich far better than its chicken counterpart. Sorry for the iffy beef rendang burger photo folks. Sambal Shiok’s creations aren’t quite as addictive as the superficially similar sandwiches from Galbi Bros, but they’re still cracking. Silmar’s Taste serves up a rotating selection of sweet and savoury baked Portuguese goods. The selection is always eye-catching, even though the individual goods themselves are often merely middling. 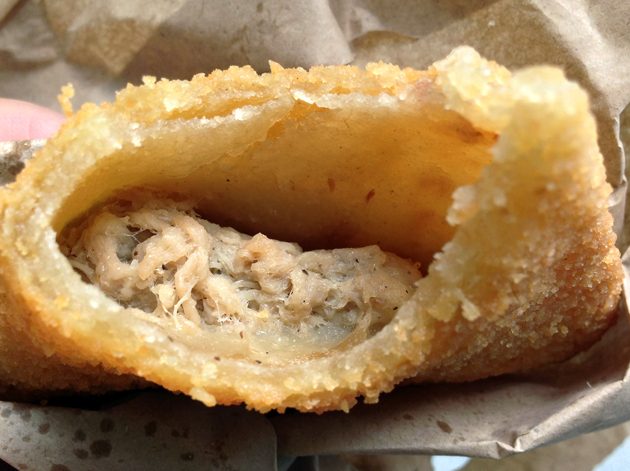 A coarse, buttery, slightly chewy pastry filled with suckling pig sounds intriguing, but the coarse, lightly seasoned rillette-like filling wasn’t especially porky. 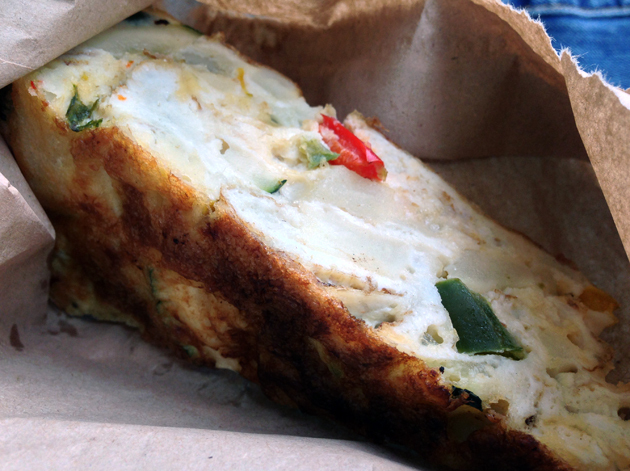 A tortilla, or Spanish omelette, was an unexpected sight. Served chilled, it was dense rather than fluffy or creamy but nonetheless pleasing due to its fillings of crisp courgettes and peppers. A light dish that works best in hot weather. 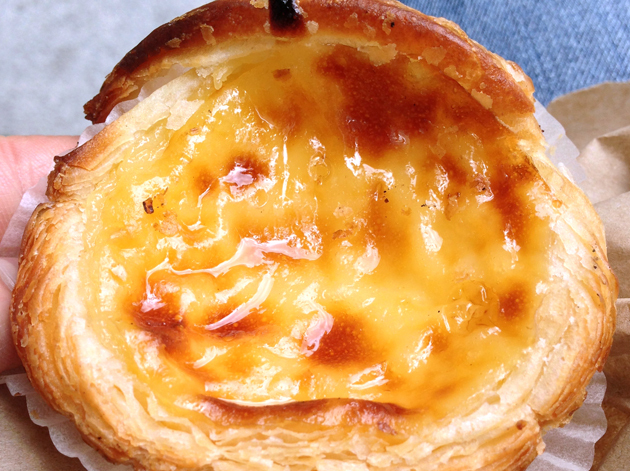 Nata tarts are a Portuguese speciality that can be found in an increasing number of cafes across London. Sadly, the version here was disappointing. The pastry cup was a little too chewy. While the egg custard filling was suitably light, it wasn’t as creamy and eggy as the best examples in Lisbon. Rice flour muffins will be instantly attractive if you’re gluten intolerant. 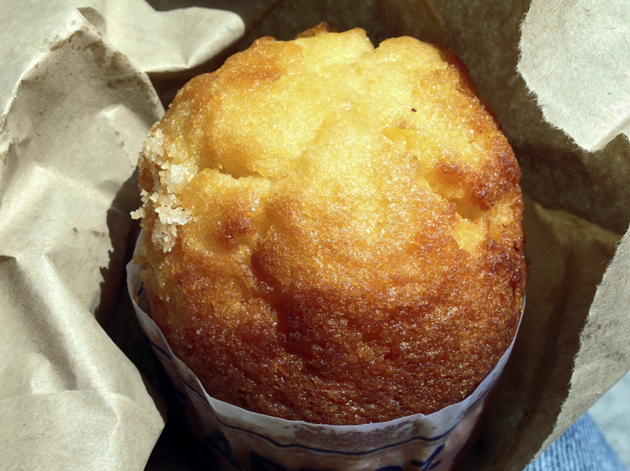 The muffins I had were fluffy and moist, but only had a muted taste of lemon to them. Attempting to bring Portuguese food to a wider audience is a noble cause, but the wares from Silmar’s Taste left me cold. Humorously, Japanese curries are based on English versions of Indian curries. If you’re familiar with chip shop-style curries, then their resemblance to Japanese curries is immediately familiar. 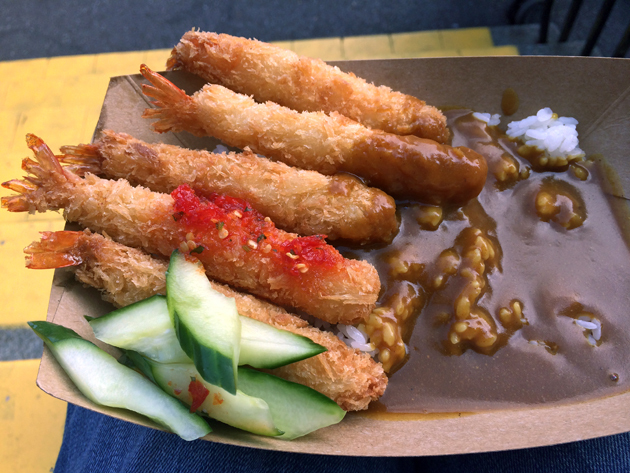 As its name suggests, Alley Katsu Curry serves up katsu curries – breaded, fried meat smothered with curry sauce. Alley Katsu’s sauce is pretty good – thin, sweet and lightly peppery. Given the limited facilities of a market stall, none of the katsu meats are freshly fried, so they lack the crispy crunch of the best katsu. Nonetheless, the katsu chicken was firm, moist and used a whole fillet of chicken, while the prawns were small but sweet and juicy. Accompaniments of lightly pickled cucumber and a mildly garlicky chilli sauce were suitably tart palate ticklers. Alley’s katsu curries may not be perfect, but they’re still filling and flavoursome enough to be worth seeking out. If nothing else, a sweet katsu curry is a welcome change from the usual street food fare – especially on a brisk, cold day. 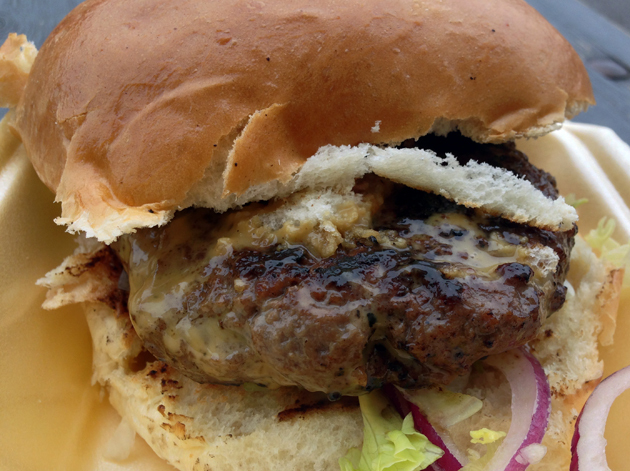 I’m generally resistant to the idea of ‘ethnic’ burgers – it often seems like a lazy way of jazzing up some substandard patties. I’m willing to be convinced otherwise though, especially if the results are as good as Galbi Bros’ pork burger. Veal Smasher would argue that anything other than a beef patty isn’t really a burger, but the pork version is the proprietor’s favourite and for good reason too. A tender, mildly fatty and slightly chewy patty was topped with a mildly spicy, musky sauce that resembled traditional Korean fermented bean pastes. 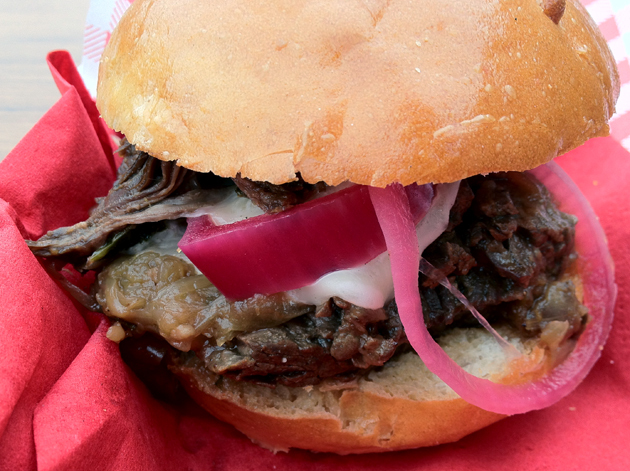 It was a moreish and addictive combination served in a crisp bun. My only complaint was that the pork patty was a little small. 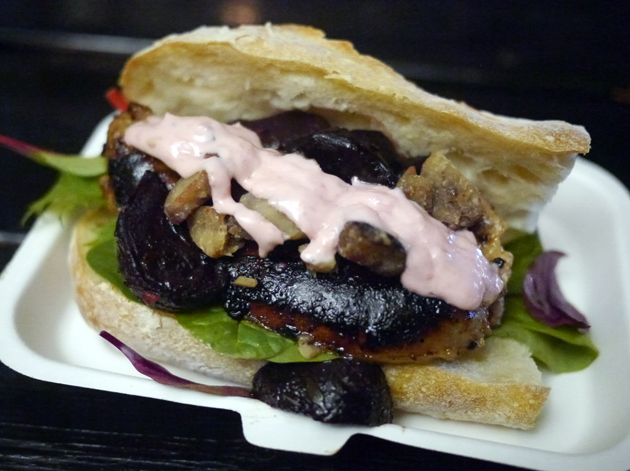 Gabor’s Kitchen is north London bakery that also sometimes moon lights as a street food vendor. The oddly named ‘Mother of All’ is a steak sandwich. Tender slices of bavette steak cooked rare are great, but it was hard to appreciate the steak as it was obscured by the chewy ciabatta, sweet onions and earthy mushrooms. The hotdog was an oddity, using neither a wiener or a wurst but a very British-style pork sausage instead. Although very meaty and moist, it was ill-matched with dabs of weak horseradish and overpoweringly earthy beetroot. The stodgy, chewy ciabatta-esque roll didn’t help either. The meat at Gabor’s Kitchen is very good indeed, but smothered under ill-matching, sometimes substandard accompaniments. Gabor’s Kitchen needs to go back to Gabor’s drawing board. 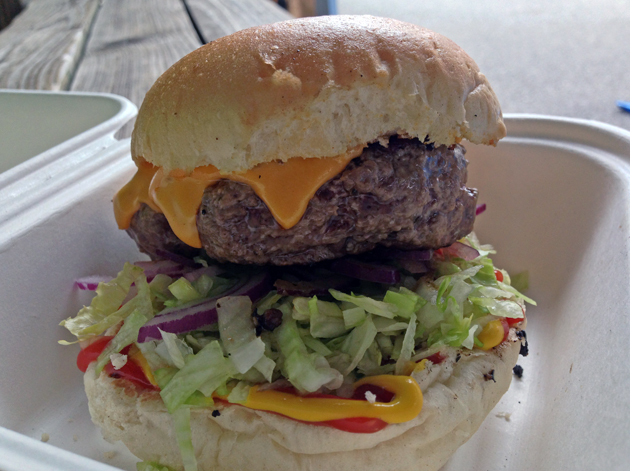 Burger Bear is one of the few burger stalls that I missed from my round up of independent burger eateries, a particularly unjust omission given how good the Bear’s burgers are. Although a five patty monster is often available off the menu, I opted for a far more sensible single patty cheeseburger. Although the American-style cheese and lettuce were both limp, the patty itself was glorious. A moderately coarse ground allegedly cooked medium rare, it was more on the rare side which was definitely a good thing – tender, pink, quivering and tangy. Lightly seasoned, the patty was complimented very well by the remarkably sweet ketchup and sharp red onions. The whole thing was held together by a soft bun that stayed out of the way. 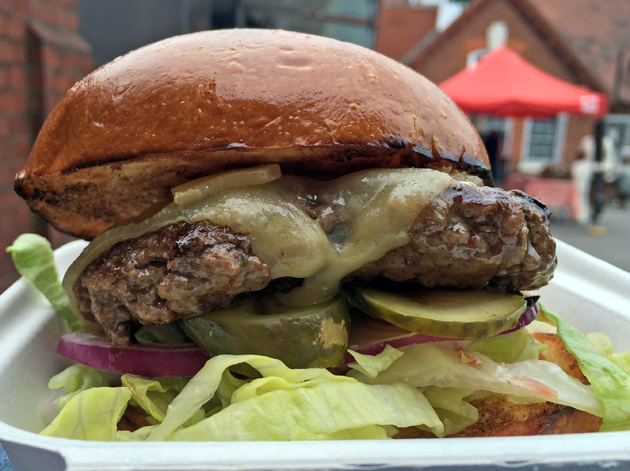 Burger Bear currently has a pop-up at The Old Nun’s Head in Brockley, which means fewer appearances at Harringay Market. If he does pop up, it’s well worth snarfing one of his quality burgers. Capish currently has a residency at a pub in Dalston, so it doesn’t make nearly as many appearances at Harringay Market as it used to. This is a real shame as its Italian-American sandwiches are perfect Sunday afternoon fare. I can barely remember the bread used in the beef braciole, as it melted away acting as nothing more than a receptacle for the meaty goodness entering my mouth. Tender slices of beef were bathed in a sweet yet moreishly satisfying sauce. This was enhanced further by sweet caramelised onions and creamy melted taleggio cheese. Superb stuff. 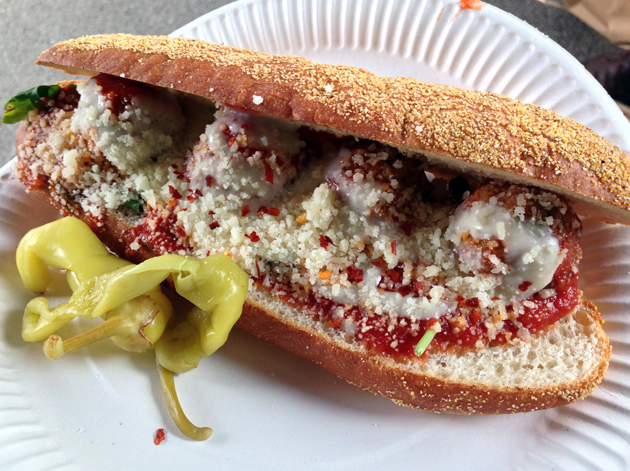 Slightly tough bread and insipid chilli flakes were the only complaints I had about the meatball sub. The moderately coarse, herby meatballs were made even better by a lightly musky, earthy provolone cheese. Meat and cheese – a classic pairing elevated to new heights at Capish. 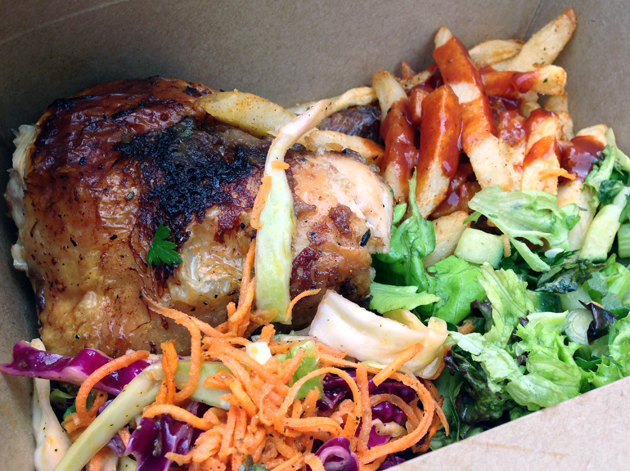 There’s no shortage of chicken eateries in London, but some of them are distinctly ho-hum. The Spinning Hen is distinctly better. The chicken served by the quarter, but also available as a half or whole bird, was moist, charred and lightly smoky. Equally simple were the accompaniments – soft, fluffy chips and a crisp, refreshing salad. If you must eat out for chicken, then this is the way it should be done. 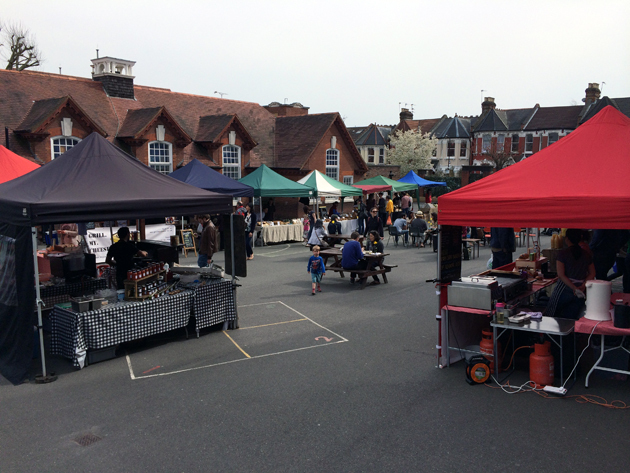 Harringay Market doesn’t rival London’s other street food markets for size, but its small selection of street food vendors is often well chosen with the stands often going on to great success elsewhere. The selection of vendors is ever-changing, and unsurprisingly seems to grow bigger and more varied in the warmer months. Sambal Shiok, Peel and Chimney, Galbi Bros and Pasta e Basta are my personal favourites and are well worth catching whether they’re trading in Harringay or elsewhere. Tags: alley katsu curry, backstreet diner, burger, burger bear, capish, cheese, chicken, curry, food truck, gabor's kitchen, galbi bros, goat, grill my cheese, island grill, jerk, katsu curry, london, market, pasta, pasta e basta, peel and chimney, pizza, pulled pork, review, sambal shiok, sandwich, sandwiches, silmar's taste, spinning hen, steak. Bookmark the permalink. Just to let you know all are meats ( we only do chicken) are fried at the market hence the double fryers although we have not been at the market since June 2013 , Alley Katsu.